We appreciate your feedback about your support experience with WooCommerce, developers of Storefront Powerpack. This helps us maintain high standards on the WooMarketplace, and helps WooCommerce improve. Customizing your theme has long been a hassle that no one enjoys undertaking. With Storefront Powerpack, you can change all that. 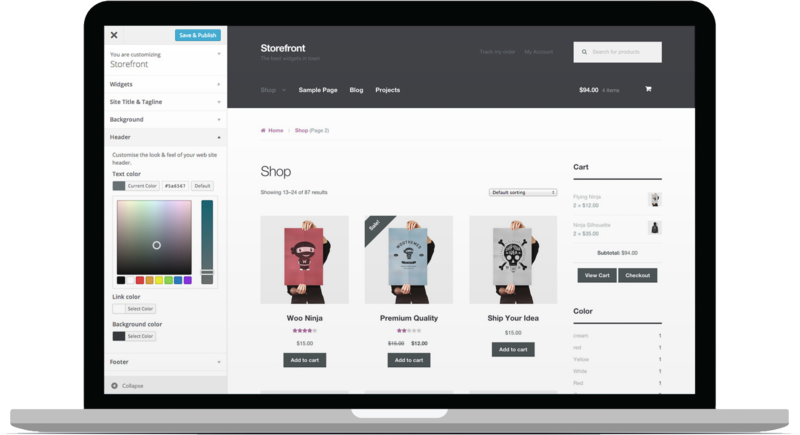 Powerpack gives you the ability to customize and style nearly every aspect of Storefront without ever touching any code. Change your store’s header layout, tweak colors, fonts and layouts of almost any element, change text, checkout flow and more. Preview your changes instantly in the Customizer. Make changes to a single product page or on a global scale — it’s all up to you. Powerpack is compatible with all Storefront Child Themes. Easily add or remove header components such as the logo, cart and navigation. Then simply drag and drop to arrange the layout. Switch between various checkout layouts, toggle ‘distraction free’ more and other options designed to boost your sales. Hide unwanted text boxes or tabs, change the appearance of your image gallery and much more. Point and click to select elements and style them in real time. Adjust typography (Google fonts included), colors, margin, padding, and more. Update your homepage’s text, buttons and layout from a simple and familiar editor. From structural elements like the main site container, to buttons and products, Storefront’s appearance is completely under your control. You can see how Powerpack works as we create a Storefront style inspired by the ASOS clothing brand.